Building schools is an initiative Tabitha added several years ago. Only one in five primary school children attend two or more years of school. At the secondary level, it drops to one in 12. 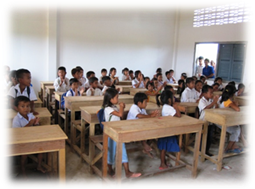 Schools throughout Cambodia are filled to maximum capacity, with one group attending in the morning, and a second group in the afternoon. Over the three-year life of this program, 22 schools have been built providing education for about 15,000 Cambodian children. In the 2010-2011, 14 schools were completed. There are currently 20 communities that Tabitha has identified as needing schools and construction can begin when funding for the schools has been secured. In communities that have been in the Family Savings Programme for many years, families can afford the mandatory uniforms for children and a small monthly tuition fee. The government provides funding for teachers and books, but villages are left to find a school facility. In most cases, there is no facility, or it is too small for the number of school-age children, or it has a leaky roof and crumbling walls. Some school buildings being used are in such bad shape that they are near collapse. This program relies on close cooperation between Tabitha Cambodia, the local communities, and the national government (via the Ministry of Education). It is based on the fact that while there is an acute shortage of schools, particularly in rural areas, an excess of teachers are being trained in Phnom Penh. Donate towards schools or other Tabitha fundraising goals. Understanding this situation, Tabitha Cambodia builds and equips schools, and then passes ownership and the responsibility for the running of these schools – including the supply of teachers – to the government through the Ministry of Education. 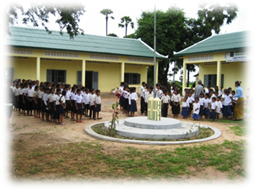 Over the life of this program, tens of schools have been built providing education for about 15,000 Cambodian children. In 2010-2011, 13 schools were completed. There are currently many more communities that Tabitha has identified as needing schools, and construction can begin when funding for the schools has been secured. What does the government provide? What does the community provide?